Yesterday was Mad Monday again! The first Monday of every month where I share with you a Thermomix recipe that is very quick, but also is popular and a great family meal. However yesterday was so mad for me that I didn’t even get to publish this recipe! I’ll be the first to admit that I LOVE my passata recipe and I am consistently trying to find new ways to use it in recipes. So when I had some Ravioli in the fridge I thought of my Ravioli passata dish – then I go to the freezer – NO PASSATA!!! Disappointed!!! 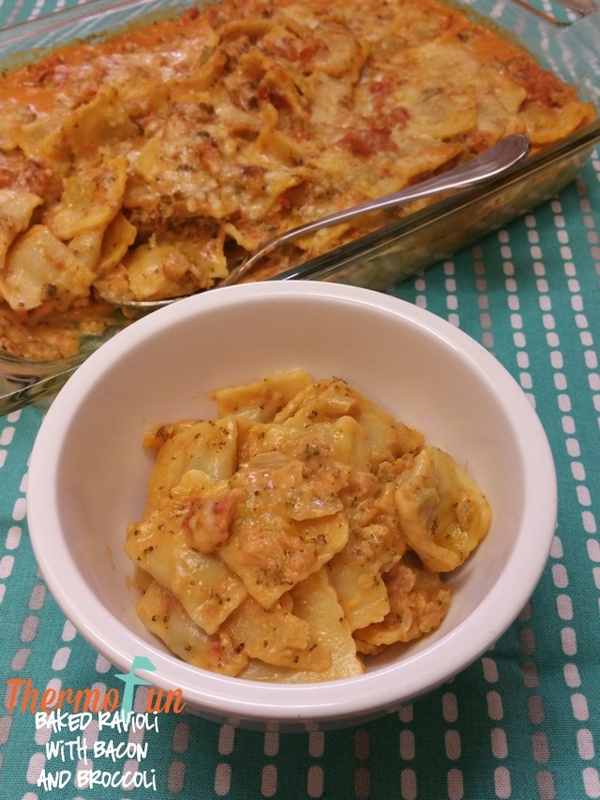 Off to the drawing board – I come up with thermomix baked ravioli with broccoli and bacon. Cook ravioli or tortellini following package instructions and drain. Place oil, garlic, onion, bacon and broccoli florets into TM bowl and chop 3 sec / speed 5. Add tomatoes, tomato paste, stock and mixed herbs and cook 6 mins / 100°C / speed 1. Add cream and heat through 2 mins / 100°C / speed 1. In a large baking dish, combine pasta, sauce and half the parmesan. Sprinkle remaining parmesan on top and bake in oven 12-15 mins. Oh yum, can’t wait to make this one. I HATE broccoli too, although do love creamy broccoli soup! This is delicious. Made it this week and each of my children and my husband individually commented how tasty it was. This was absolutely delicious and exactly what I wanted to indulge in today in this heat! I used speck and cooking cream and wished I had cooked the beef ravioli in the Thermomix, but did it the traditional way and melted the cheese on top with my air fryer; keeping the kitchen cool today! Def keeper recipe! P.S. LOVE the use of broccoli!